To some, a barrel of crude may look like a gooey liquid who’s only redeeming virtue is to be eventually refined into gasoline. Researchers broke down a typical barrel of domestic crude oil into what may be produced. By the way, the average domestic crude oil has a gravity of 32 degrees and weighs 7.21 pounds per gallon. Enough liquefied gases (such as propane) to fill 12 small (14.1 ounce) cylinders for home, camping or workshop use. Enough gasoline to drive a medium-sized car (17 miles per gallon) over 280 miles. Asphalt to make about one gallon of tar for patching roofs or streets. Lubricants to make about a quart of motor oil. Enough distillate fuel to drive a large truck (five miles per gallon) for almost 40 miles. If jet fuel fraction is included, that same truck can run nearly 50 miles. Nearly 70 kilowatt hours of electricity at a power plant generated by residual fuel. About four pounds of charcoal briquettes. A barrel of oil can't elevate your style, can't stop the rain or can't quench your thirst. But it can make a wrinkle-free shirt, it can make umbrellas and it can make drinking cups. 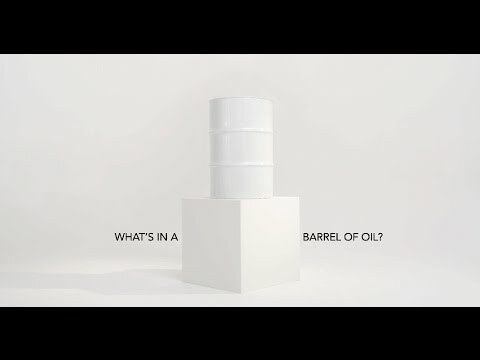 The lighter materials in a barrel are used mainly for paint thinners and dry-cleaning solvents and they can make nearly a quart of one of these products. The miscellaneous fraction of what is left still contains enough by-products to be used in medicinal oils, still gas, road oil and plant condensates – a real industrial horn of plenty.